Warning: long (13 minutes) profound, demands uninterrupted active listening. Prestige cover (right) shows the Esquire a clean pair of heels, once again. Poor show, chaps. 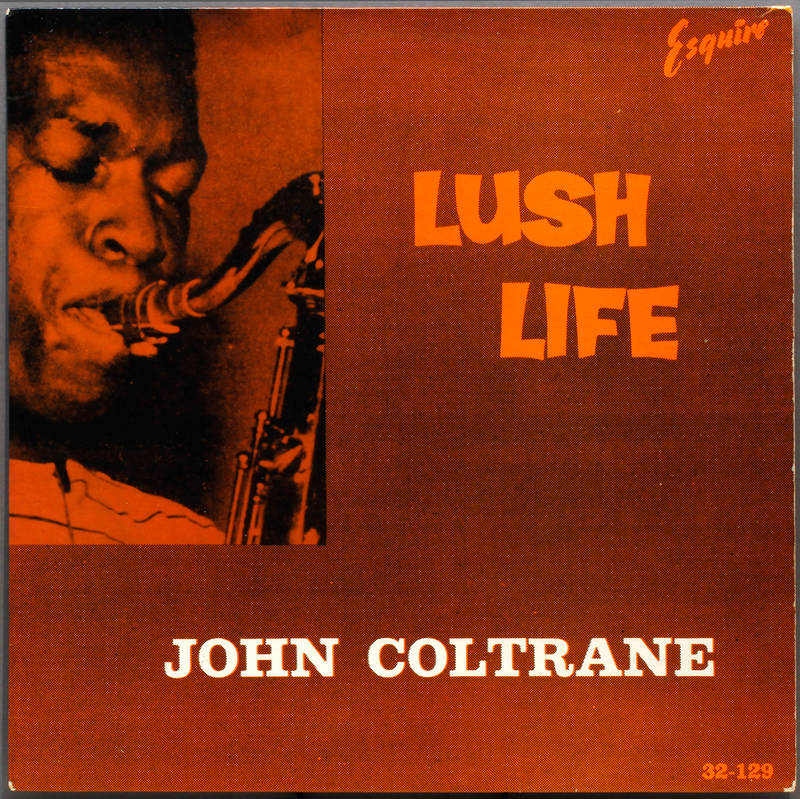 Prestige released Lush Life in 1961, over a year after Coltrane had signed to Impulse Records. They still owned earlier unissued recordings and, as Coltrane’s star rose, Weinstock saw the opportunity to bring more Coltrane to market. 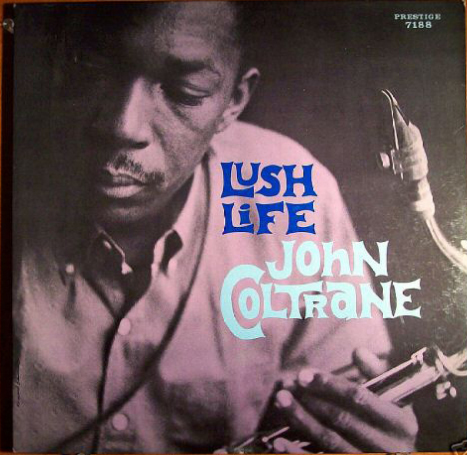 It’s not Blue Train, it’s not Giant Steps, it is Coltrane in lyrical mode, with the luminous ballad Lush Life (Billy Strayhorn) the stand out track. It has been described somewhat unfairly as “the ideal Coltrane album for people who don’t like Coltrane.” I put it the other way around. 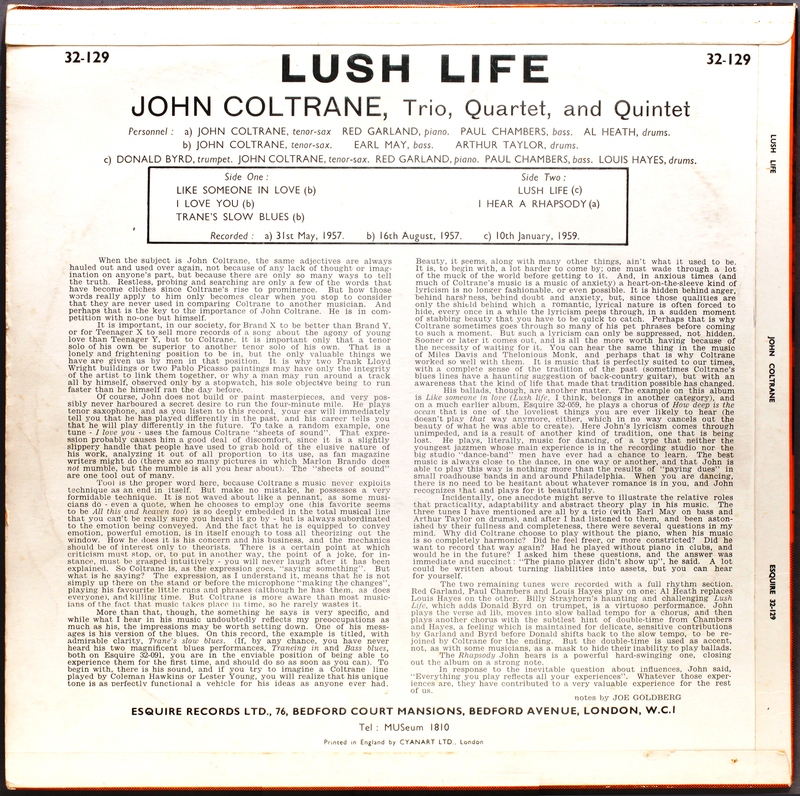 From a start point of blistering pyrotechnics, Lush Life gives you a different insight, into the melodic strength and calm inner voice of Coltrane. The original lyrics of Strayhorn’s ballad have not fared well with the passing of time. “I used to visit all the very gay places. Those come-what-may places…I’ll live a lush life in some small dive ..” to which The Village People retort “Young man, there is a place you can go …. (throw hands in air, mime alphabet) Y. M .C .A .” The song is about failed romance (Strayhorn was reportedly gay) and was recorded again in 1963 by Coltrane, this time with Johnny Hartman on vocals. One for the completist, I’ll resist. Is highly recommended by several posters, who have taken me to task. To be updated at some future point. 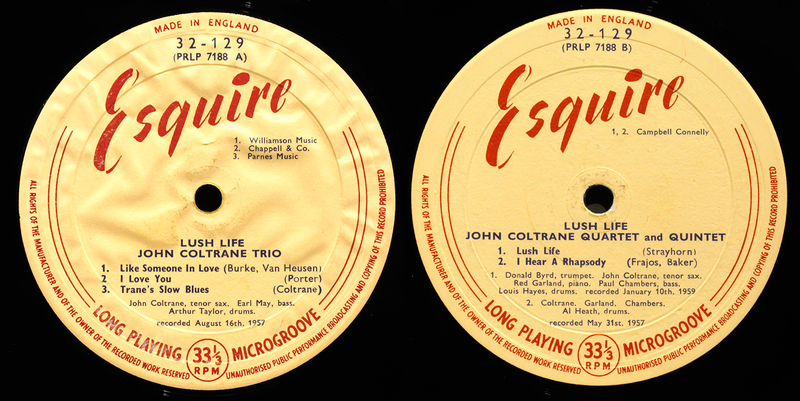 On top of the recent addition of Soultrane, and Coltrane Jazz, hot on the heels of Giant Steps and Traneing In, fortunately Lush Life is in a quite different musical vein, and fortunately for the budget, the Esquire came in around a third of the cost of the US original Prestige in like condition. Strong competition in the auction, I blame myself for advertising the virtues of Esquire online.The upside, of course, is the enhanced value of my existing collection of Esquires, which often offer a better audio experience than Prestige, and of course good prices encourages more records to come to market. That’s the theory at least! Congratulations, Simon. You are this week’s winner! There isn’t actually a “prize”. It’s symbolic. Sorry. No, really, there is no prize. Don’t be like that. I said sorry. Look, its the taking part that counts. What do you want – your name in lights? SIMON WON. Happy now? This entry was posted in Esquire, John Coltrane and tagged Donald Byrd, Esquire, John Coltrane, Louis Hayes, Paul Chambers, Prestige, Red Garland by LondonJazzCollector. Bookmark the permalink. My guess on the side A label is that you’ve got a special ‘bonus’ label placed on top of the original. I have a pressing of Michael Kiwanuka’s new record that has that exact problem and looks nearly identical. I have another LP with this problem as well, but I can’t recall which. Perhaps you can auction off the extra label on eBay. BTW, I’m curious as to your conclusions as to the origin of this pressing. Is it one of the British Homophone Monster LPs or just a normal weight Decca (?) affair. It is in the same weight range as most of my other Esquires that are late Fifties or early Sixties ie I believe Decca. Only the very very early pressings around 1955/6 are exceptionally heavy Esquires. This is just “normal” very heavy. It gets more interesting. I have just in the last week or so acquired a couple of Esquires which are NOT Prestige releases. 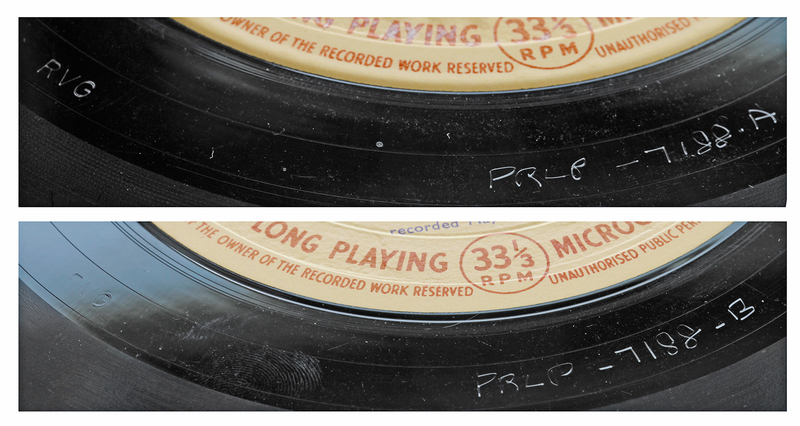 No RVG/ PRLP catalogue numbers. They are releases from different companies under different US licensing agreements , and because they dont have a US-supplied stamper, the UK pressing plant (until now, no clues) has had to remaster a tape for the Esquire release. As a result, the matrixes are engraved “in their own hand”. Now Sherlock Holmes enters… watch this space. My first encounter with an exceptionally heavy Esquire was their version of Sonny Rollins Plays for Bird, a rare example of the blokes at Bedford Court Mansions outdoing Prestige in the cover art stakes. 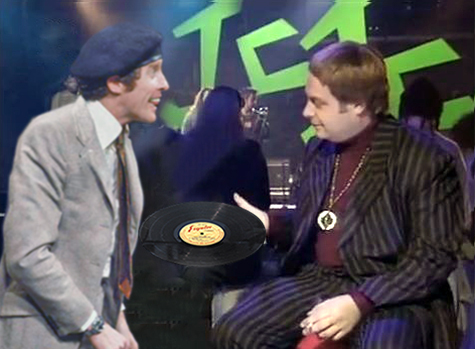 It’s streets ahead of the original and I’d imagine easier to find….. Wait, wait, wait. Are you saying that you either: (a) don’t have; or (b) don’t recommend the Coltrane / Hartman album or version of “Lush Life” ?! I’ve dropped my monocle in shock! I love (adore, adoringly) the version on this record – Garland’s piano solo is wondrous – but the Coltrane / Hartman version is utterly spectacular in every way and is, I believe, regarded as the definitive version. And the original Impulse mono vinyl is gorgeous; Hartman sounds like a dream. In fact, when I’m introducing friends to classic jazz, I often play BOTH versions for them back-to-back so they can see how the same musician has interpreted a song in two different ways, depending on his fellow musicians, arrangement decision, etc. And because both versions are so lovely, it always wins them over. Now what you are telling me is that the vocal version of Lush Life is great. And Garlands solo is even better than the wonderful one on the Coltrane only. Bugger. I’ll have to look out for a copy. This old dog quite happily learns new tricks. Sorry, I was unclear – Garland’s solo on the album you’re reviewing here – Coltrane’s Prestige “Lush Life” – is the BEST. The Coltrane / Hartman date’s personnel is Coltrane’s famous Impulse group – Elvin Jones, Jimmy Garrison, and McCoy Tyner. That version of the song “Lush Life” is much shorter, with much less soloing (although Tyner is obviously wonderful in support). What sticks out for me is that Hartman really makes the lyrics come alive; they don’t seem dated at all, but fresh and sad (as you rightly point out, they “read” in a very dated way). You can feel a bit of Strayhorn’s pain; it’s the only version I can say this about, and it’s both haunting and beautiful. You won’t regret allowing this bit of vocal work under your roof. Also, can I take the liberty of also recommending, from the vocal arena, at least one James Moody record with Eddie Jefferson singing vocalese on it. Killer stuff. An original Argo pressing would sound terrific on your system. By the way, love your blog; keep it up! Ha–I thought the same thing when I read that. Coltrane/Hartman is a wonderful record, you should check it out for sure. I’ve always enjoyed hearing McCoy Tyner in that context as well. Wait till you hear the original impulse! Stereo version of Coltrane/Hartman playing Lush Life! Fantastic. Thats seven votes to my zero, I give in! I am sure it’s Great! OK OK I got the message. No original copies up on ebay – seems everyone is holding on to theirs. I’ve got a soft spot for the Prestige era Coltrane’s and this was among my first Coltrane purchases. 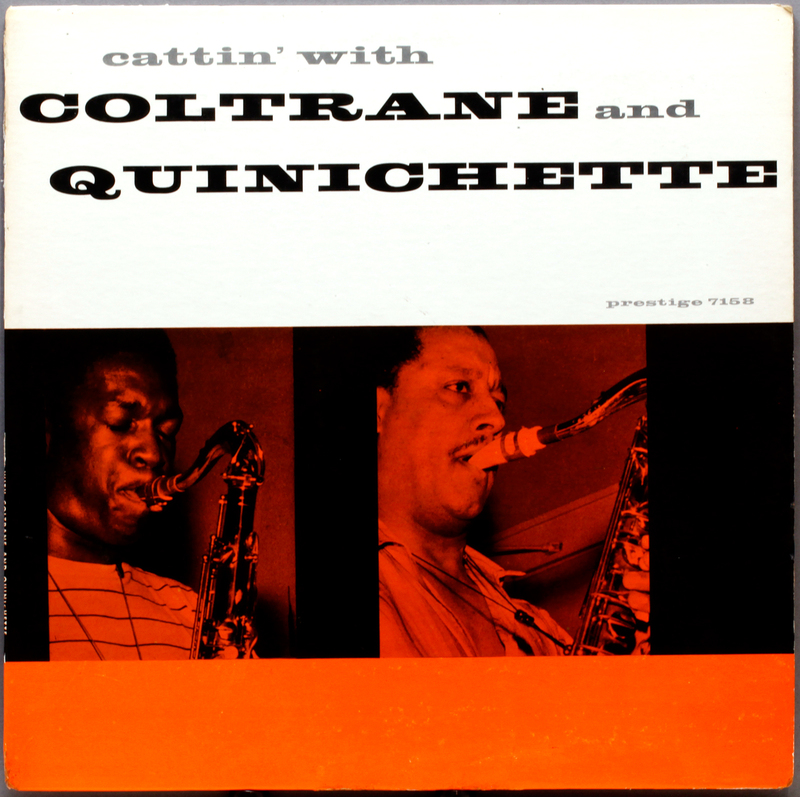 A beautiful album, although points are docked for Esquire pinching the photo of Cattin’ by Trane and Paul Quinichette. It must have been an odd sort of assignment; “Right chaps, here’s the American original. High quality photograph, stark and well-placed wording, 12 inches of style. Now, go and design a cover that costs the equivalent of a packet of Turf cigarettes…..oh, and make it look….er…..different to the Yank one”. Good catch, the Cattin’ cover. I have put an update at the post at the end. Congratulations.